Justin Hoenke, the executive director of a small public library, has been talking to all types of library staffers for A Day in the Life, his new column in Information Today. Among other things, he asks them about their typical days, moments that made them proud, their current projects, and how they balance their library work with the rest of their lives. Here’s a look at his first five columns, which have been lightly edited and condensed for the web. You can read the full interviews in Information Today, starting with the September 2017 issue. If you’re doing something exciting at your library that you’d like to share, email itletters@infotoday.com. In 2015, I traveled halfway around the world to attend the LIANZA (Library and Information Association of New Zealand Aotearoa) Conference. I went there as a keynote speaker with the aim of inspiring New Zealand librarians, but in the end, I think I was the one who was the most inspired. 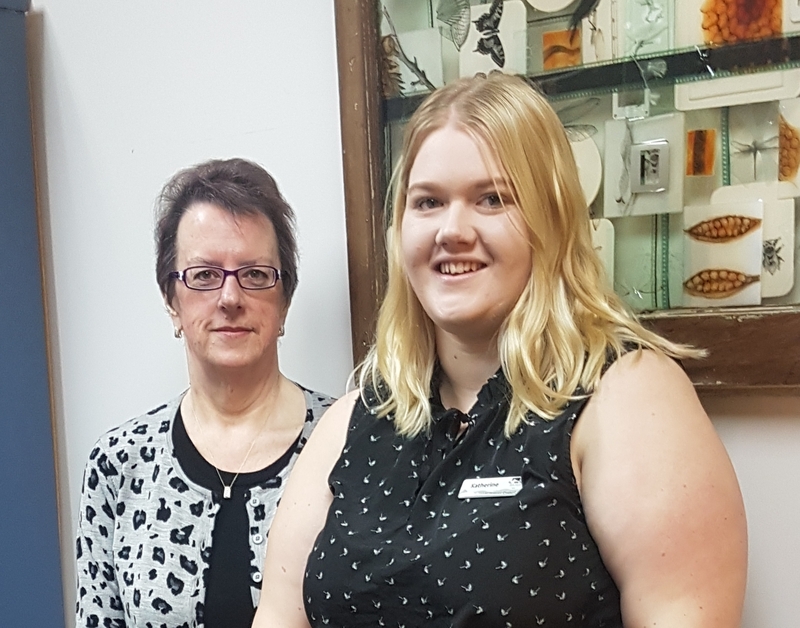 During my trip, I spent some time with Cath Sheard (on left in photo), the libraries and cultural services manager at the South Taranaki District Council. Since I was just beginning my career as a library director, I listened to Cath’s advice about management very closely. Cut to about a year later when Cath’s post, “When Staff Do Amazing Things,” showed up in my RSS feed. It focused on the work of Katherine Bosworth (on right), an assistant librarian at one of Cath’s branches. I thought it would be great to catch up with Cath and Katherine and share their wisdom with all of you. Can you tell me a little bit about how you made the decision to start using the InDesign program to make fliers, posters, and booklets for your library? Cath: We already had one or two staff members in the organization with access to it, so there was some precedent. I needed to decide if the investment was worth it. There wasn’t just the money to consider, but also the time it takes to learn new software. What I know is that investing in staff training always pays off in increased skills and better staff engagement. Added to that, I want the collateral we use—fliers, brochures, adverts, etc.—to look professional. Katherine: When I was first given the opportunity to use InDesign, it was very overwhelming. I had only ever used Microsoft Word to create posters and booklets, so using a platform that has such an intricate design element, it took a while for me to get used to the way it worked. I am very lucky to have had the support that I did, and still do have, as there are four others within the council who use InDesign for various tasks. I worked very closely with the comms department and had monthly “design” meetings where I learnt new skills and made mock posters to practice. Occasionally, I would be able to share something that I had learnt that they might not have known. Other than that, I would YouTube or Google how to do something. Typically, as time went by, my designs became better and better due to lots of practice and repetition, but I will always be learning new aspects of the software as there is so much to learn and multiple ways to do the same thing. A lot of people say that one of the drawbacks of technology is that it isolates people from each other, but from Cath’s blog post, it seems like you two work really well together. Can you talk about how you two work together and with others in your library? Cath: My office is next to the main workroom and main service counter, so staff members have easy access to me. It’s rare for me to close my door except for meetings or if there are 50 excited kids squealing with delight over Legos! I used to have scheduled meetings with Katherine, but it didn’t work for us. We get more done if she just drops in when she needs to chat. Katherine: I really enjoy working with Cath. To me, Cath is the type of person that tells it how it is—which is something I really value in a manager. As someone that is starting to become more involved in the library profession, having someone like Cath as my manager is amazing. She gives the right amount of support and guidance. She always has extremely helpful advice, and she knows how to direct you in finding your own answers to problems without solving it for you. Justin Hoenke is a human being who has worked in public libraries all over the U.S. and is currently the executive director of the Benson Memorial Library in Titusville, Pa. Before that, he was coordinator of tween/teen services at the Chattanooga Public Library in Chattanooga, Tenn., where he created The 2nd Floor, a 14,000-square-foot space for ages 0-18 that brought together learning, fun, creating, and public events. When not in libraries, Justin and his partner Haley work on Fidelia Hall, an arts and community center that provides people with a platform to express their creativity. Follow him on Twitter (@justinlibrarian), and read his blog at justinthelibrarian.com.